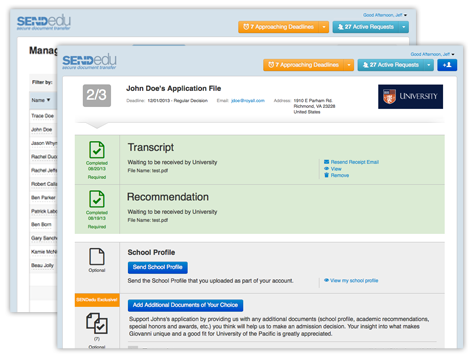 Start sending supporting application documents on behalf of college and university applicants quickly and securely through SENDedu today. SENDedu is a free, secure electronic document transfer service for counselors, teachers, student references and other officials involved in the application completion process. This service allows you to upload supporting application documents to colleges and universities safely and quickly, with no paperwork or hassle. Plus, once you've created an account, you'll have access to a centralized, organized location where you can manage each applicant's profile and admission documents. With new users signing up every day, our member base is growing quickly … and we look forward to having you join us! Our priority is protecting your privacy and security while providing the most convenient service available. Our service is in compliance with the Family Educational Rights and Privacy Rights Act. The documents you upload cannot be accessed by anyone other than the intended college or university. SENDedu uses industry-standard encryption (SSL). Our users are overwhelmingly satisfied with SENDedu's secure and simple interface. SENDedu is a trademark of EAB. Contact us at contact@sendedu.org or 1-855-SEND-EDU.